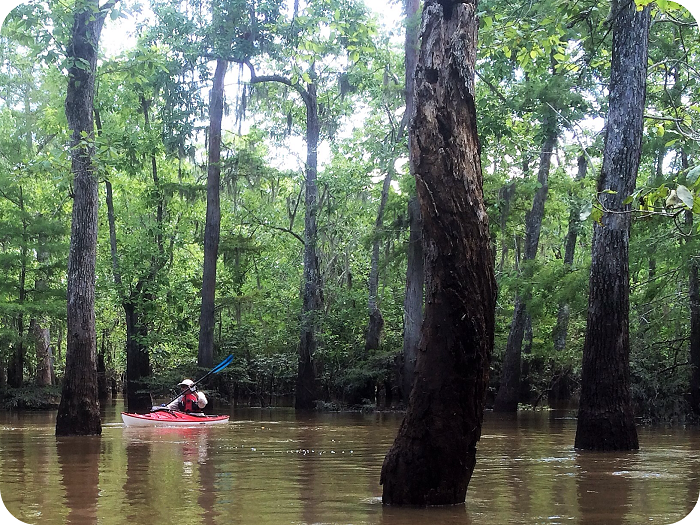 The Neches River/Big Thicket Kayak Tour gives our participants a chance to paddle through the beautiful moss-draped cypress-tupelo slough in the biologically diverse Big Thicket National Preserve. Easily accessible from points in eastern Texas and western Louisiana, the kayak tour starts at the LNVA Saltwater Barrier Boat Ramp just north of Beaumont, Texas. We will paddle up the Neches River taking the left fork to Pine Island Bayou and into Cook’s Lake. We will explore the moss draped slough between Cooks Lake and Scatterman Lake and back to the Neches River on this 4.8 mile loop tour. This tour is relatively flat and very close to sea level giving paddlers a fairly easy paddle upstream; flow is generally quite low. The riparian corridor of the Neches River supports a great diversity of plant and animal life along the river and beyond the banks. Birds spotted here include: herons, egrets, cormorants, barred owl, belted kingfisher, osprey, pileated woodpecker, prothonotary warbler, roseate spoonbill, swallow-tailed kite, and wood duck. A variety of plants can be found along the river as well, including bald cypress, black tupelo, loblolly pine, oaks, river birch, ferns, cardinal flower, spider lilies, and Neches River rose mallow. Common wildlife encountered include bullfrog, leopard frog, opossum, red-eared slider, raccoon, river otter, American alligator, alligator snapping turtle, and a variety of water snakes. Select your tour date and kayak from the pull down menus above. Need help selecting a kayak or prefer a custom tour date? Call or email us!